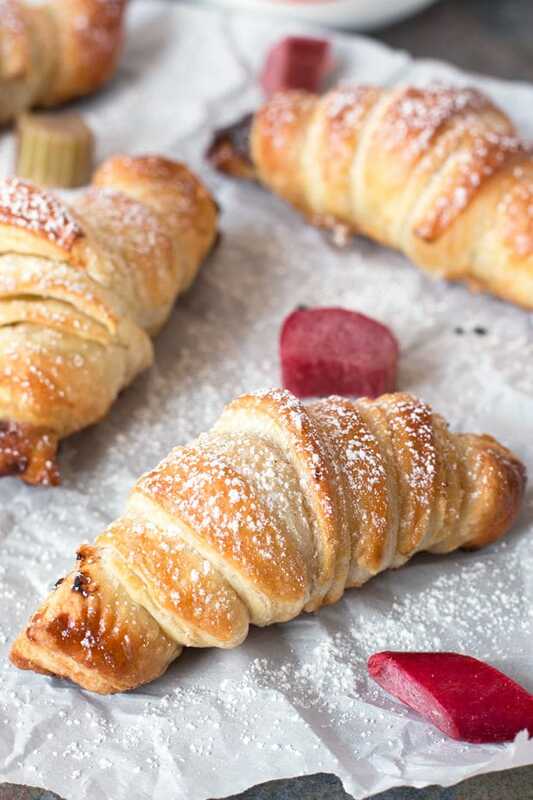 Nutella Rhubarb Puff Pastry Croissants are the easiest way to get your pastry fix at home! 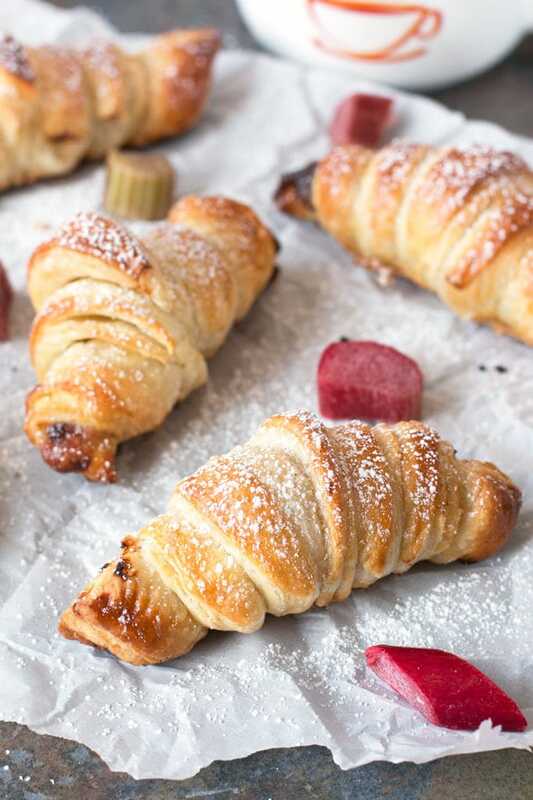 Fresh, vibrant rhubarb puree and Nutella fill these flaky pastries made out of frozen puff pastry. Grab a couple with your morning coffee to start the day off with a burst of fruity, chocolatey goodness! I remember going to Starbucks way back in Freshman year of high school (*shudders*) to grab myself a croissant and a vanilla latte for lunch most days. Those were the days of trying to stretch my allowance and avoiding the really fancy pastry shop my grandmother would always take me to in swanky Cherry Creek. If she was going to buy them for me, I could hold out until the next time I saw her with the ones from Starbucks. I only wish I knew how to make puff pastry croissants at home before today. I went to a four hour (yes four whole hours) pastry class a few years back and we made croissants from scratch. From. Scratch. It was one of those experiences that you cherish because you have nothing else to do that day but bake and roll out dough five million times and eat all the tasty treats. When I returned to reality, with recipes in hand, I found that I really didn’t have time to be spending hours on making croissants at home… Which truly saddened me since I lived no where near a pastry shop that was up to snuff. Then I discovered the magic of making puff pastry croissants from the packaged sheets of dough you find at the supermarket. Yes, I am aware that this is a shortcut and some of you might judge me, thinking I am cheating. Trust me, if I had time to spend hours on these croissants I would. However my craving is strong, my impatience is real and I just want the hot and fresh from the oven in less than 45 minutes. 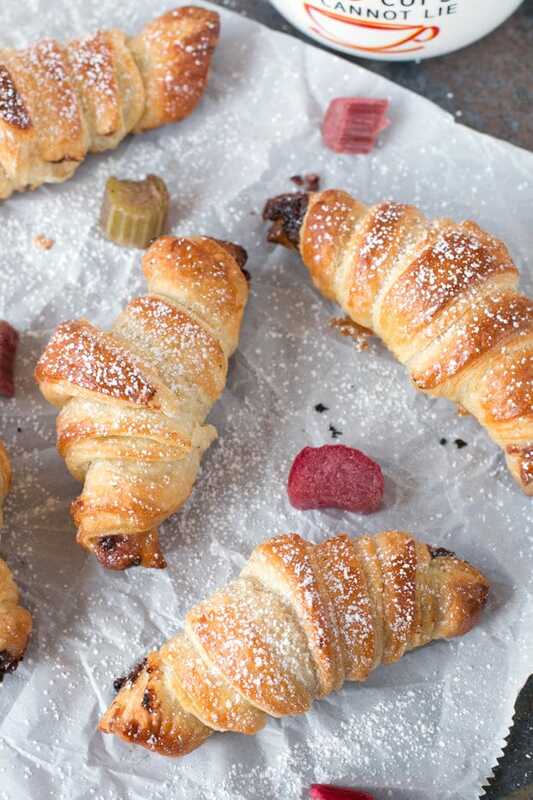 If the simple croissant itself isn’t enough to make you swoon, the Nutella and rhubarb puree stuffed inside these little guys will. The simple-to-make rhubarb puree gives a warm, fresh and fruity tartness to the flaky pastry. When combined with a sultry dab of gooey Nutella, the chocolate and fruit combination makes your eyes pop right out of your freaking head. I love sitting on the patio in the warm morning sun with one of these in hand, my steaming cup of coffee in the other hand. Even with the dogs running around like maniacs and barking at every sound they hear, it’s a welcome little slice of heaven to start the day off with. 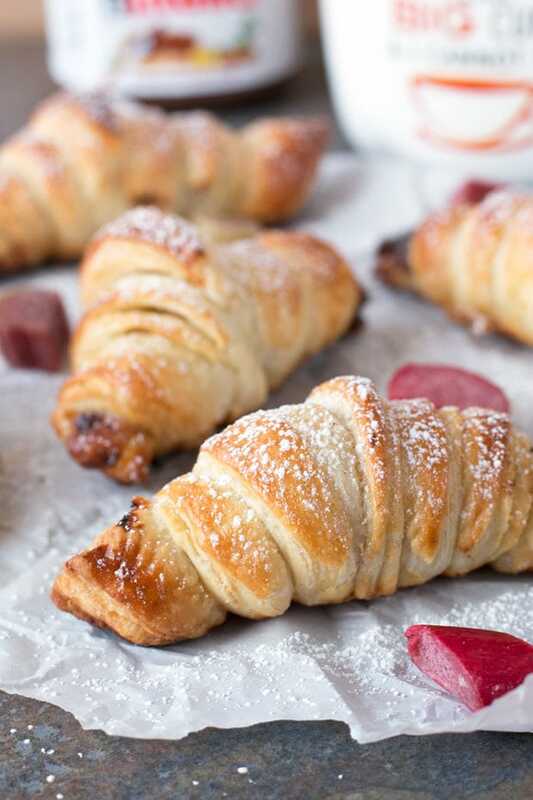 Pin this Nutella Rhubarb Puff Pastry Croissants recipe for later! 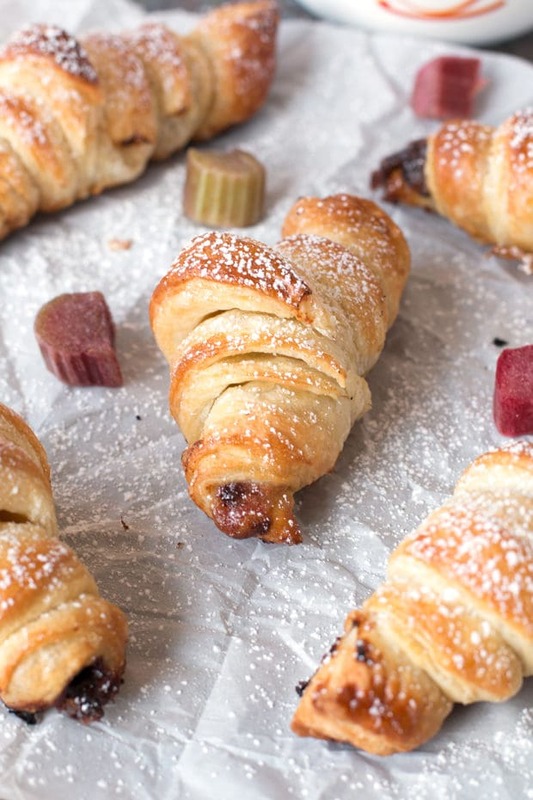 Fruity, chocolate and flaky, these croissants are stupid simple and DELISH. In a small saucepan, add chopped rhubarb, sugar and water for the puree. Bring to a simmer over medium heat and cook for 10 minutes, until the rhubarb is fork-tender. Add the mixture to a blender or food processor and process until smooth. Pass through a fine mesh sieve and cool. On a clean, lightly floured work surface, place one sheet of puff pastry. Cover the sheet of puff pastry with the cubed butter and top with the other sheet of puff pastry. Roll out the puff pastry sheets into a large, thin rectangle, doubling the original size of the sheets. Be gentle so you do not tear the sheets. Cut the dough into large triangles from top to bottom. 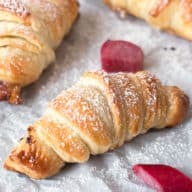 Place 1 tsp of rhubarb puree in the bottom large end of the puff pastry triangles in the center. Top the puree with 1 tsp Nutella. Gently roll up the triangles from the large end to the skinny end, making sure to tuck the tops under the bottom. In a small bowl, beat together egg and 1 tsp water. Brush the tops of the croissants with the egg wash.
Bake for 25 to 30 minutes, until golden brown and cooked through. Let cool and top with powered sugar.